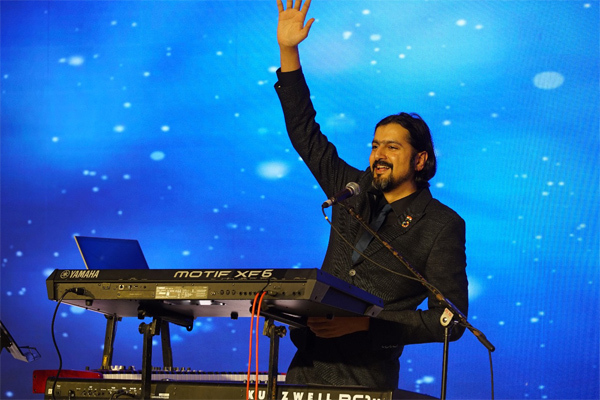 MUMBAI: Ricky Kej, a Grammy Awardee at the 57th Annual Grammy Awards for his album Winds of Samsara, is one of the Key speakers at the eighth edition of TEDxGateway which is scheduled on 4 February 2018 in Mumbai. TEDxGateway is bringing 25 motivational speakers from different walks of life to share their inspiring experiences and stories on varied topics. An accidental dentist but a born musician, whose 14th studio album made a debut on the US Billboard New Age Albums Chart in August 2014, with Radioandmusic, shares his journey in the music field and speaking at TedxGateway. You discovered your love for music when you were already set to become a dentist. I was never a dentist; I always wanted music to be my life and profession. My parents absolutely disagreed with me. So, I made a deal with my parents, that once I completed a degree in Dental Surgery, my life would be my own. So that is exactly what I did. I completed my degree, gave the certificate to them, and became a full-time musician. There was never any intention to practice dentistry, nor did I practice, even for a single day. Tell us about your journey in the musical field. Ever since I remember, I have always been a musician. My ears have always been more important than my eyes. While most of my classmates in school were fascinated by television and cartoons, I was more hooked on to my music system. I would pull apart songs, try and figure out the instruments used, who played those instruments. I would learn about different cultures and people through music. I started off my music career making music for TV and radio commercials for multinational brands. In a very short span, I saw tremendous success. I was making music for everyone from Google to Microsoft, Toyota, Pepsi, Mc Donald’s, HSBC, Suzuki, Vodafone, Coca-Cola, Levis, etc. A few years later it dawned on me that these big brands are spending thousands of dollars on me to create music for them and then millions to air the music. They understood the power of music. Music is a very powerful language, not just for communicating a message, but for retaining that message deep into the consciousness of a listener. The songs that we learn during our childhood are the songs we remember until the day we die. The morals we learn through those songs stick with us throughout our lives and the big brands understood this and were ready to base their massive multi-million dollar campaigns on music to drive a message of sales. That’s when I decided that I needed to use my gift of music to make this world a better place, by communicating a positive message through music. All my music needed to be an extension of my personality and beliefs, and every piece of music needed to be a reflection of me as a person. People and audiences are my greatest motivations. Since my music has a strong message of environmental consciousness, I love playing to large audiences. At the same time, I love performing for small intimate audiences of policymakers and change-makers. One of my most inspirational moments was playing at the United Nations General Assembly Hall in New York. Just being within that hall, standing and performing at that same spot where most world leaders have stood, deliberated on every major treaty and global decision, was a massive motivational experience. I played my music for environmental consciousness to the world leaders, and I was happy I could reach out to them with my message, through the emotional language of music. It is moments like these that motivate me to carry on stronger. What was a major turning point in your life? After I won the Grammy, our Hon'ble Prime Minister of India Narendra Modi invited my wife and me to a private meeting to his office. What I thought was going to be a short photo opportunity and the congratulatory meeting turned out to be an hour long philosophical discussion. Our Hon'ble Prime Minister advised to me to dedicate my music to raising awareness on climate change and conservative issues. Being a passionate environmentalist, I was immediately drawn to this. I went ahead and made an album Shanti Samsara my epic album for environmental consciousness. The album featured over 500 musicians from over 40 countries including India, United States, Australia, Turkey, Algeria, Senegal, Sweden, Korea, China, Vietnam, Tibet, Azerbaijan, etc. They all came together to celebrate the natural world, and raise awareness on climate change. The album was launched at the United Nations Climate Change Conference COP21 in Paris by the Indian Prime Minister and the then French President Francois Hollande. So, meeting Prime Minister Modi was a major turning point in my life. There are constant challenges that artiste have to face in their lives, I too face challenges on a daily basis. Ever since I decided to dedicate my life and music to Environmental Consciousness, it has been a constant challenge to dispel myths, reach out to people, and to bring about massive behavioural and policy change through music. I have seen a lot of success in this, but at the same time, I have experienced many failures. While spreading a positive message for change, it is very easy to slip into negativity and hard-core activism. It is important to stay positive and use positive re-enforcement. The minute you try to shame people into action, or use exploitative language or images, you end up turning people away, rather than effectively bring about change. How was it producing jingles for major brands? Producing jingles has been an overall enjoyable experience. It is like a ‘work-out’ where the more jingles you do, the better you get at it. The time span for a single creative is very short, so every day is a new challenge. One day I get to work on a Celtic jingle, the other an EDM jingle, then a Tamil folk jingle. So, I am constantly on my toes learning and experiencing different forms of music, working with varied creative people and musicians from across the world. All these influences did rub off on my own music. I also developed a very thick skin to criticism, where I could take every comment constructively. I also learnt to differentiate between creative criticism and plain malice. Tell us about your collaboration with TEDx. TEDxGateway is a wonderful platform for new ideas, and to showcase motivating stories to a large audience. When I was invited to be on TEDxGateway, I was thrilled and I immediately agreed. Their shows are produced superbly; the group of organisers is passionate about what they do. Also, it is a great opportunity for me to reach out my music on environmental consciousness to a larger, receptive audience. Would you like to give a message to the budding singers? Always follow your heart, write songs about things that affect you on an everyday basis. Do not wait for someone to pay you to make music, being a creative person; you need to constantly express yourself through music. Music is not just a profession, but a way of life. Do not treat it as a hobby. Try and appreciate multiple art forms, this is the only way to constantly rejuvenate your creative mind. Most importantly, do not use creativity as an excuse for laziness. Work very hard, because hard work and passion can substitute for any lack of talent you may have. What are your further plans and projects? Lots of concerts all over the world, and an education program for children, where I plan to bring about environmental consciousness in children through teaching them songs about nature. I also am hosting an awards program for musicians who create music for a positive purpose. MUMBAI: One of the biggest Rajasthani folk singers, the legendary Kutle Khan will be performing at the event titled, - Sounds From The Deserts.